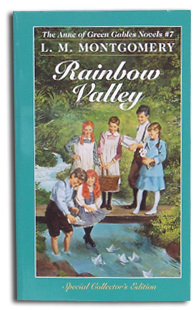 Rainbow Valley is the seventh book in the Anne of Green Gables series. Just mentioning this should be suffice to acknowledge that the book is a sweet children’s classic delivered in Montgomery’s exquisite prose. In this book, Anne Shirley is married to Gilbert Blythe and is the mother of six lovely children. Hard to imagine Anne as a mother of six kids, right? But Anne doesn’t feature much in the book. The story revolves around her children, the new neighbor’s neglected children (the Merediths, whose father is a widowed minister), and an orphaned waif, Mary Vance. Befitting a children’s story, the children get into mischief due to a few comedies of errors, and end up getting chided by the adults. So they decide to teach themselves to be in good conduct. Of course, they need to first figure out what “good conduct” really means. What is good, what is bad, what is heaven, what is hell, what is moral, what is a sin? Ooh, a whole lot of heavy questions for kids to decipher. Montgomery shows the perplexities faced by a child when the world ceases to be black and white, even if one lives in a seemingly perfect and peaceful community such as Avonlea. Avonlea, much like most communities in the early 20th century, was a conservative society honoring Victorian virtues. Social etiquette, decorous behavior, religious fervor, and codes of moral propriety were strictly defined. Without the discipline of a mother, and enough concern from the father, the Meredith children lacked fine grooming. They were frowned upon for not knowing the “right” things to say, or how to conduct themselves in social gatherings and in church, much to their father’s humiliation. But, although they were free-spirited kids who didn’t mind waving their arms in glee than sit still in church, they had good, kind hearts. They took pity on Mary Vance, a girl who ran away from a tormenting employer, gave her a place to stay, food to eat, and above all kindness and friendship. When these kids were constantly rebuked for their frivolous behavior, they set out to punish themselves to redeem and reform their ways to be socially and morally acceptable. The innocence and earnestness tugs your heart. I really liked the fact that Montgomery explores a heavy subject from the simple perspective of children. There’s an instance where Mary and Una try to sort out the moral predicament of lying. Would telling lies always get you down to Hell? Mary innocently states that she had to tell multiple lies to save herself from getting beaten by her unfair and mean employer, while Una wonders if God would be so unkind to banish such girls who lied, to Hell. God was surely much more fair and merciful in his judgments, right? It reminded me of the time I had such a mini-revelation and wondered how God would decide whom to punish. And to this day, I continue to ponder, along with several other intelligent adults. Underneath all the merriment and innocence of childhood, is the question of what constitutes as mere social propriety and what truly is morality. Of course, Montgomery doesn’t delve deep, but gives a nice enough introduction to the beginning of the end of childhood. With a happy ending, a little contemplation and the naivety of childhood suffusing the book, which child wouldn’t like this book? Karthik, I believe all of us retain the child in us, so I'm sure you will enjoy reading them :). But some books in the series can get a tad too sweet. It's best to sandwich them between heavy reads! It's so nice to see that other people have enjoyed reading L.M. Montgomery's Anne series as much as I did. I first learned of Anne back in the late '80s when my mother taped the TV movie series; little did I know then that there were books available! I'm hungrily devouring them all and this is the book I'm currently on. Who'da thought my mother, who has never read a novel in her life, could have unearthed such a treasure for me.